Andrea Jedwab and Adrian Breitfeld are the proud parents of a lively baby girl who fills their life with joy. But little Mili Breitfeld, who joined her then- 20-month-old brother Liam in May 2012, is very lucky her mom believed in getting good prenatal care. Her new doctor also saw something that “wasn’t right.” He referred Andrea to the Pediatric Cardiology Division at Children’s Hospital & Research Center Oakland, where they performed a fetal echocardiogram when she was 18 weeks pregnant. Most cases of transposition of the great arteries are diagnosed in the first hours or days of life because the baby has low oxygen levels and may appear “blue” rather than a normal, healthy color. Babies with this defect also breathe rapidly, and their hearts work harder than normal to try to get more oxygen to the body. If the defect is not corrected, there is a 50-percent chance the baby will die within the first month of life and a 90-percent chance of death within the first year. Any delay in diagnosis and treatment may result in serious problems for the child, including brain damage or damage to other organs such as the liver and kidneys. 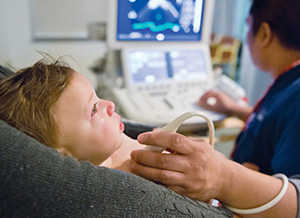 Children’s cardiologists and cardiac surgeons are an integral part of the Fetal Medicine Center at Children’s. 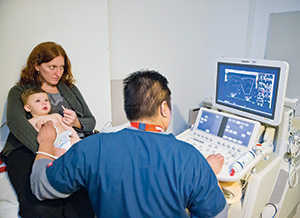 This center cares for the fetus before birth and provides rapid diagnosis and management of fetal abnormalities by a team of pediatric specialists. Because Mili’s heart defect was diagnosed during pregnancy, the team at Children’s was able to prepare a plan of care for Mili’s family. Andrea and Adrian were frightened by the diagnosis of their baby’s heart defect, as any parent would be, but they did appreciate the time they had to prepare. Andrea kept up her regular prenatal exams with her obstetrician and additional appointments with Dr. Rosenfeld, with frequent echocardiograms to monitor the baby’s heart. Dr. Rosenfeld coordinated the care plan with Medical Director of Cardiology Hitu Patel, MD, and Chief of Pediatric Cardiac Surgery Olaf Reinhartz, MD. Dr. Patel, who specializes in cardiac catheterization procedures, would be responsible for improving and stabilizing the oxygen flow to the baby’s body. Dr. Reinhartz would perform the surgery to correct the transposed arteries. The Children’s medical team was notified as soon as Andrea went into labor, and baby Mili was transported from Alta Bates to Children’s within hours of her birth. Adrian and his brother went to Children’s to be with Mili while Andrea recovered overnight at Alta Bates. The medical team got to work right away raising Mili’s blood-oxygen level, which was a dangerously low 60 percent. The doctors used medication to help keep open a small blood vessel near the heart that connects the pulmonary artery and the aorta, allowing some mixing of oxygen-rich blood with oxygen-poor blood. Then Dr. Patel performed a heart catheterization procedure to create an opening between the upper chambers of the heart to allow more blood to mix. That first night, Mili needed some assistance with her breathing, and for the following two nights, the staff at Children’s kept a close watch to make sure she was ready for corrective surgery three days after her birth. Correcting transposition of the great arteries involves a complex surgical procedure called an “arterial switch.” Mili’s surgeon, Dr. Reinhartz, describes the arterial switch procedure as a “fantastic surgery” that illustrates the advances made in pediatric cardiac surgery. Mili’s family recently moved again, this time to a larger home in Pleasant Hill, where they will still be close to the expert care they found at Children’s in Oakland. 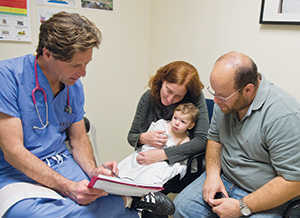 Mili’s cardiologist, Dr. Rosenfeld, who will continue to follow her case until she reaches age 21, expects her to lead a completely normal life. Because Mili’s heart defect was diagnosed during pregnancy, the team at Children’s was able to prepare a plan of care for Mili’s family.